Danny Contreras, an eyewitness Las Vegas shooting survivor who publicly claimed there were multiple shooters involved in the attack, has been found dead in an empty house in Las Vegas with multiple gunshot wounds. His body was found in a vacant home in the northeastern valley after a neighbor heard a man groaning inside the building and called 911. Police say Contreras was dead when they arrived at the 5800 block of East Carey Avenue, near North Nellis Boulevard. The woman who called emergency services to the scene says she didn’t hear any gunshots, but the coroner confirmed that Danny Contreras, 35, died of “multiple gunshot wounds” and ruled his death a homicide. 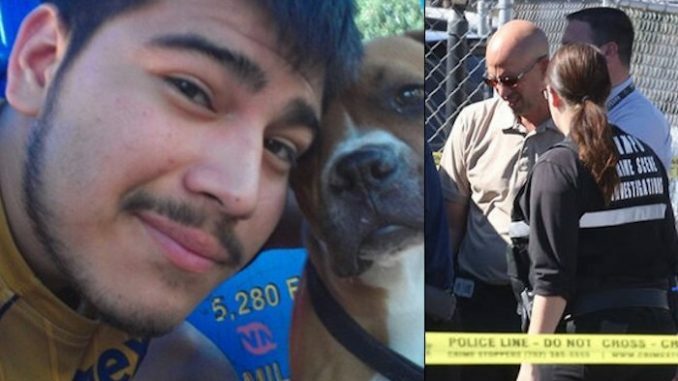 Directly contradicting the official narrative that only one shooter fired on the Route 91 Harvest festival crowd, Danny Contreras tweeted the day after the attacks saying he was “lucky to be alive” after he was “chased by two gunmen”. Posting on Twitter, Danny Conteras stood in solidarity with many of the survivors and insisted that there were multiple gunmen involved in the attack. His tweet was retweeted hundreds of times. In the face of all evidence, and countless survivor testimonies, mainstream media is perpetuating a major cover-up by claiming there was only one shooter. Las Vegas Review-Journal reported on the death of Danny Contrera and claim that Metropolitan Police Department homicide Lt. Dan McGrath told them Mr Contrera may have had gang ties or have been involved in narcotics. While this may or may not be true, what is becoming increasingly difficult to ignore is the number of bodies stacking up after the Las Vegas shooting. Are they being silenced to stop the truth coming out? Chad Nishimura, the Mandalay Bay valet who parked Stephen Paddock’s car, went missing in the days following the shooting, after giving an interview to a Hawaiian mainstream outlet KITV4 in which he contradicted the official narrative, and pointed out that Paddock “didn’t have many bags.” Certainly not enough to cart 27 semi-automatic weapons, thousands of rounds and modifications up to the room. Mr Nishimura has yet to surface. Unfortunately, the fate of other eyewitnesses is more certain. Kymberley Suchomel of Apple Valley, California, was found dead in her home, hours after her husband left for work. Ms Suchomel gave a very detailed account of what happened in Las Vegas, insisting there were multiple gunmen involved in the shooting. Claiming that mainstream media was not telling the truth, Kymberley was planning on creating a survivor’s group to continue the quest for truth and justice. Whether this series of disturbing deaths and disappearances are purely coincidental or whether there is something deeply sinister afoot has yet to be determined, but the response by law enforcement and mainstream media – in particular, their refusal to address the questions that the informed public want answered – is leading many to arrive at the same conclusion. There is a major cover-up underway. Although the Las Vegas Review Journal doesn’t mention that Contreras was an eyewitness to the Las Vegas shootings, it does confirm that he was found shot dead in a vacant home. With the death of Chad Nishimura, a Mandalay Bay valet whose account also contradicted the official narrative also recently found shot dead, it begins to look as if an operation is underway to silence those whose testimony calls into question the official version of events. Ed.